After today, I will be out of town for a week and will have very limited access to email, so if your trying to reach me, it may take several hours before I'm able to respond. If you purchase my new Framelit Floral Tutorial (listed below), you will automatically be directed to the download site as soon as you check out through Paypal. Please remember to bookmark it to your favorites, so you will always have access. If you place a $35 (before tax & shipping) Stampin' Up! order through my online store, I will email you the link. Again, very limited access to email, I apologize, but it may take awhile before I'm able to send it. 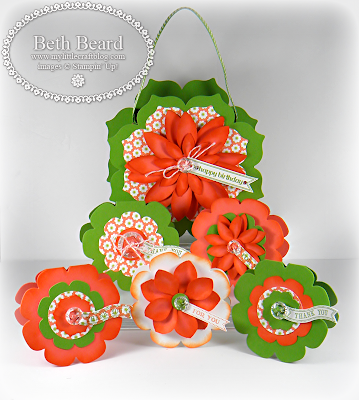 You will make 5 beautiful, all-occasion cards, a gorgeous floral bag, plus there’s a bonus tutorial on how to make envelopes for your handmade cards. This set makes a beautiful and stylish gift for those special people in your life. You will receive a PDF copy of step by step instructions, supply list, color photos, and you will receive access to all the videos for each project. There's no time limit, you will have unlimited access to the videos. The cost is $9.95 or free with a $35 Stampin' Up! online purchase. I hope you have a massive response to this Tute Beth...it is awesome. Too much fun to be had.